It has been the custom of the Roman Church, at least in modern times (we mean from the 17th Century forward), to veil the crosses and the images of the saints from the 5th Sunday of Lent until Easter. 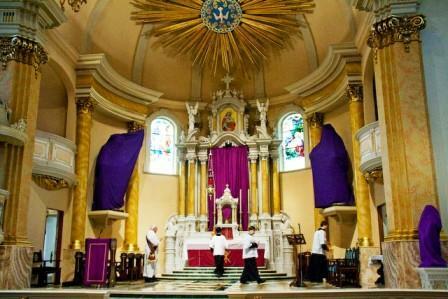 This has been, and ought to continue to be, one of the defining characteristics of the season of Passiontide – a season which, if after the postconciliar liturgical reforms lost in name, need not be lost in spirit. Still in many churches throughout the West, crosses and statues are veiled now and will remain veiled for two full weeks. The Catholic Encyclopedia describes this custom as follows: “Before Vespers of Saturday preceding Passion Sunday [i.e. the 5th Sunday of Lent] the crosses, statues, and pictures of our Lord and of the saints on the altar and throughout the church, with the sole exception of the crosses and pictures of the Way of the Cross, are to be covered with a violet veil, not translucent, nor in any way ornamented. The crosses remain covered until after the solemn denudation of the principal crucifix on Good Friday. The statues and pictures retain their covering, no matter what feast may occur, until the Gloria in Excelsis of Holy Saturday.” However, it is noted that the statue of St. Joseph may remain uncovered, if outside the sanctuary, during the month of March, which is dedicated to his honor. Of course, this practice is no longer mandatory in the Novus Ordo, but it is certainly permitted. However, if the custom is to return to popularity, it will be necessary to come to some understanding of the meaning behind the veiling. Why does the Church veil the cross in these final days of Lent, a time when she is most intent on meditating upon the Lord's dolorous passion? Abbot Gueranger enlightens us with a mystical interpretation of the Gospel which, in former times, was read on this Sunday: As Christ hid himself from the rage of the Jewish authorities (John 8:59), so now he is hidden from the world in preparation for the mysteries of his passion. “The presentiment of that awful hour [of our Savior’s passion] leads the afflicted mother [the Church] to veil the image of her Jesus: the cross is hidden from the eyes of the faithful. The statues of the saints, too, are covered; for it is but just that, if the glory of the Master be eclipsed, the servant should not appear. Considering that, in the season of our Lord’s passion, all the strength of our devotion should be directed to the Cross of Christ, we may be surprised that the images of the Cross are to be covered in these days. However, when we recognize that we now venerate the Cross not so much as an emblem of victory (as in the Triumph of the Cross) but as an instrument of humiliation and suffering, we will soon understand the spiritual realities which are conveyed through the covering of the crosses. In his passion, our Savior’s divinity was almost totally eclipsed, so great was his suffering. Likewise, even his humanity was obscured – so much so that he could say through his prophet: I am a worm and no man (Psalm 21:7). His face and whole body were so disfigured by the blows and scourges that our Jesus was scarcely recognizable! Thus, the wounds he endured hid both is divinity and his humanity. For this reason we veil the crosses in these final days of Lent – hiding our Savior under the sad purple cloth. “Some authors say there was a practical reason for this practice insofar as the often-illiterate faithful needed a way to know it was Lent. Others, however, maintain that it was a remnant of the ancient practice of public penance in which the penitents were ritually expelled from the church at the beginning of Lent. After the ritual of public penance fell into disuse — but the entire congregation symbolically entered the order of penitents by receiving ashes on Ash Wednesday — it was no longer possible to expel them from the church. Rather, the altar or ‘Holy of Holies’ was shielded from view until they were reconciled to God at Easter. We would like to propose another possibility, one which need not conflict with any of those give above. It may be possible that the Church covers the images of the Cross during these days, for the same reason that she refrains from offering the Sacrifice of the Mass on Good Friday. Namely, in this time in which we mystically enter into the historical realities of Jesus’ final days, it is not fitting to have the image, sign or sacrament of the Cross presented to the faithful. Indeed, St. Thomas tells us that “the figure ceases on the advent of the reality. But this sacrament [i.e. the Eucharist] is a figure and a representation of our Lord's Passion, as stated above. And therefore on the day on which our Lord's Passion is recalled as it was really accomplished, this sacrament is not consecrated.” (ST III, q.83, a.2, ad 2) In an analogous way, it is fitting that, as the liturgical year recalls the events leading up to the Crucifixion, the Church should hide the effigies of the Cross from the vision of her faithful. Interesting post. However, one reason that I don't think it should be done in the modern parishes is that now is the one time of year that we actually have a decent sized crucifix. The rest of the year (starting on Easter) we have this "risen Christ" superimposed on a cross, with the only crucifix being the dinky little "processional" model that can barely be seen from the front pew. It is very disturbing to hear that your parish does not have a Crucifix for the majority of the year. What a terrible break from tradition! I would suspect that if modern liberal parishes started veiling during Passiontide, the people would begin to understand why the crucifix is so important ... then, perhaps, they would demand the crucifix the rest of the year. The usual way of discerning a Catholic church from that of other Christian denominations: the Catholic church has a large crucifix prominently displayed. Many of the protestant churches (from Calvin on - the "Prosperity" gospel, e.g.) deny the need for suffering as part of the human condition, even for those who are being saved. Many private homes owned by Catholics also display at least one crucifix on a wall. Jesus says that we disciples are to take up our crosses and follow Him. What is the point of hiding our belief? You ask a good question....I hope you read the article, you will find your answer there (in fact you will find four answers). Thank you Father. I have a question though: during Lent we may gain a plenary indulgence for reciting the 'Prayer Before a Crucifix' after receiving communion before an image of Christ crucified. If this prayer is said before a veiled image, would the indulgence still be gained? You ask a great question! ... the prayer itself does not specify that you be able to actually see the wounds (referring rather to interiorly contemplating the sufferings of Christ) ... still, the indulgence is gained only when the prayer is prayed before a Crucifix (so it is not enough simply to think about the crucifixion). It seems, then, that the indulgence is gained ... the veiling of the crucifix is by no means a denial of the crucifixion but instead is a means of entering more fully into the humility of the Cross. Hence, it seems to me that the indulgence would be gained even when the prayer is offered before a veiled Cross. Moreover, there is nothing in the Enchiridion Indulgentiarum which indicates any differences for Passiontide -- so, I think we can presume that the Church intends to grant the indulgence before a veiled Crucifix as before an unveiled one. As an aside, I wonder if you would consider opening an 'Ask a Theologian' box or suchlike, for us simpletons to pose those nagging questions about the faith that keep us up at night? I have found so many fruitful answers on this blog, that I have not had the chance to get from others I speak to. Thank you again, Father! I am happy to report that this morning I discovered that our new pastor covered our statues in the Church! I think this is the first time it has been done in over thirty years. Sunday they were not covered, but they were today. Now, I would like to ask your prayers, because he is intent on putting a Crucifix behind the altar but is, as you can imagine, experiencing some, er, opposition. Blessed be God for everything! Thank you for the recommendation! I have been thinking about doing this for some time and, after talking with the other contributors to this blog, I will be creating an "Ask Reginaldus" page ... where you will be able to e-mail me at a gmail account [or leave a shorter question in the comment box] and I will do my best to respond. Peace to you; oremus pro invicem! @Veronica, I am very happy to hear that the priest will be taking up this venerable tradition. Yes, indeed, we must always pray for our priests -- that God give them fortitude and counsel (as Gifts of the Holy Spirit). We reintroduced this tradition about four years ago - our intention was to create a 'blank canvas' with the church for people to have the feeling of travelling with the historical Christ to Holy Week - therefore no saints, Mary etc. We have a large crucifix about three quarter real size. It is a wonderful image draped in purple with the truth hidden within. It sounds like your reasoning is most closely associated with the fourth reason given in the article -- namely, a particularly powerful re-entry into the historical mystery. I think that there is much to this -- going through holy week with Christ. Also, I like the idea of the "truth hidden within"!